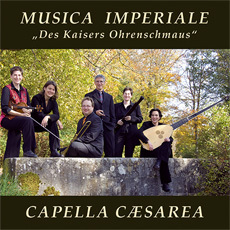 Under the title of MUSICA IMPERIALE, a feast for the Emperor's ears the ensemble Capella Cæsarea has made a programme fitting to it's name with works written by the members of the Austrian Court Chapel for this specific instrumentation. The compositions from the first ½ of the 17th century by Ferro, Bertali, Buonamente and Valentini are largely in the new style of that time, where instruments went through an emancipation and could not just be swapped for another of similar pitch. The composer wrote for each individual instrument with its particular character and technical strength, specifying in detail which instruments were to be used. Instead of just marking the parts per canto/per tenore etc. it is now per violino, per fagotto etc. The appeal of this experimental and exciting music is brought out by the vividness of the musicians' playing. They present the whole palette of colours, from the rare solo role which the chitarrone has (regularly used by Marco Antonio Ferro in duet with the violin over a basso continuo), to the large forces of the “broken consort” sound of the Capella Cæsarea in Vienna.